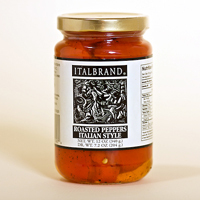 Roasted Red Peppers Italian Style by Italbrand is a product of Spain. Contains Roasted Red Peppers, Water and Salt. Compliments your favorite sandwich or enjoy with your gourmet selection. Includes a 12 OZ jar.